Are you preparing for NEET 2018? Then you must be aware of the complete NEET Syllabus. NEET Syllabus mainly consists of three sections- Physics, Chemistry, Biology. Choosing the right and best books of NEET is very important to shape your career in the right direction. Here in this article, we will provide you the best books for NEET and also recommend the best NEET Study material, so that you can get the complete guide to starting your exam preparation. To get the best books for NEET, you don’t have to go anywhere. You just require the internet connection and the best NEET study material and books will be at your doorstep. The solution is AmitBookDepot, Chandigarh. Here you can get the complete NEET Study Material at the price which will be affordable by every student. · NEET Books at 50% discount. · Same-day home delivery option. ( offer is currently available in Chandigarh, Panchkula, and Mohali). · Cash on delivery option is available. · You can also rent textbooks and save up to 80% of the money. Why go for anything else, you have such an exclusive offer in front of you. You can also check the best-recommended books for NEET Chemistry, Biology and Physics. The best NEET Biology books you must refer to your exam preparation are provided below. Chemistry is considered to be the most scoring subject of NEET. So, choose NEET Chemistry Books wisely. You must have command over numerical to get good scores in NEET physics. 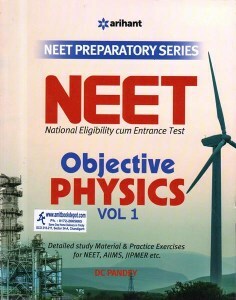 Choose Books for NEET Physics which consists of practice questions based on the concepts. You can all these NEET books at our bookstore. These are printed in easy to understand format. The font size used in these study materials and books are readable. The students who buy books from here also recommend other students to buy their books from our bookstore. The AmitBookDepot is gaining popularity due to many recommendations did to us and the way it is helping students to shape their career. Remeber, books are very important in designing your career. So, do utmost research and wisely choose your NEET preparation books.